BatchPhoto Pro is a powerful all-in-one photo manipulation program for Windows that lets photographers, web designers, business people, and families enhance photos quickly and efficiently. Simply select a group of photographs, and with a single operation annotate, touch-up, apply special effects, convert to different image types, resize, and rename every image in the group. ...... and even adjust the DPI; Annotate photos with date/time information, comments and watermarks; Rename hundreds of images in one session; Apply special effects like: sepia, black & white, oil paint, charcoal sketch and more; Touch-up photos by adjust the brightness, sharpness, contrast, and more. 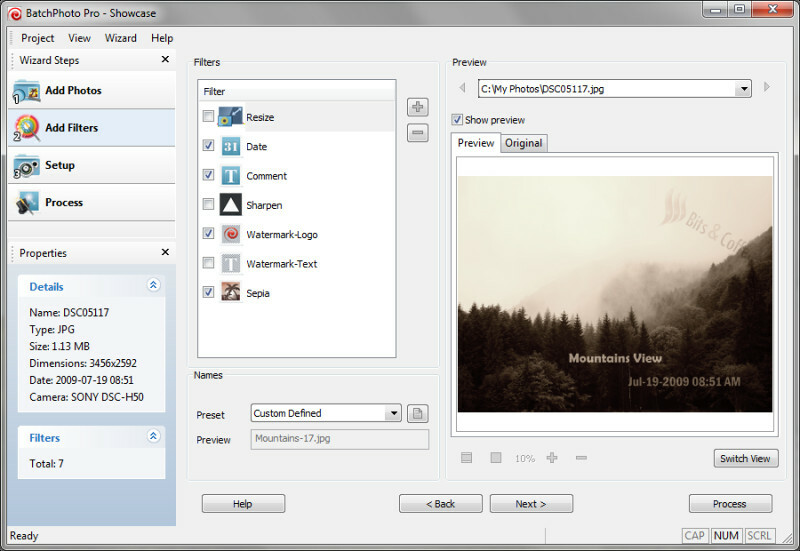 * Batch Processing - Edit hundreds of digital photos in one session with support for multi-core CPUs! Qweas is providing links to BatchPhoto Pro 3.1.3 as a courtesy, and makes no representations regarding BatchPhoto Pro or any other applications or any information related thereto. Any questions, complaints or claims regarding this application BatchPhoto Pro 3.1.3 must be directed to the appropriate software vendor. You may click the publisher link of BatchPhoto Pro on the top of this page to get more details about the vendor.